Turkish is the official language of Turkey but is also spoken by significant numbers of people in Bulgaria, Cyprus and Greece. For native English speakers, Turkish can be hard to learn. It’s known as an ‘agglutinative’ language which means that multiple suffixes are often added to words resulting in single words which mean the same as a whole sentence in English. Not all words are so challenging though, you’ll be familiar with ‘yoghurt’ and ‘caviar’ and ‘tulips’ which have Turkish roots (no pun intended). Our team of Turkish translators and interpreters are standing by to help you communicate effectively whatever you need to say. The first written records of Turkish were found in Mongolia on the Orkhon Inscriptions dating back to the early 8th century, written in the Old Turkic language using the Orkhon script. 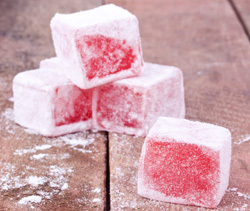 The world-famous treat, Turkish Delight. The language of the Ottoman Empire was known as Ottoman Turkish and became the administrative language of the empire. Due to the influence of Islam on the language, Ottoman Turkish relied heavily on loan words from Persian and Arabic and, by the peak of the Empire’s power, comprised more words of Arabic origin than of native Turkish. This meant that lower class and rural Turks, who still spoke kaba Türkçe (raw Turkish), found Ottoman Turkish unintelligible. This “raw Turkish” employed relatively few loan words and is the basis for what is now the modern Turkish language. 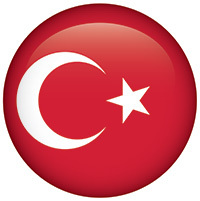 After World War 1, the resulting fall of the Ottoman Empire and the Turkish war of Independence, the Republic of Turkey was formed. Vast language reforms were ushered in, the first being the change from Ottoman script to a Latin alphabet. The next stage of the reforms was to remove all loan words of Arabic and Persian and replace them with the Turkish equivalents. Most of these words were from Turkic roots and some were from Old Turkish, which hadn’t been used for centuries. This rapid change in language meant that old and young people in Turkey began to use different vocabularies. The Turkish Language Association continues to provide words to express new concepts and technologies. The Turkish writing system utilises a Latin alphabet. The Turkish alphabet consists of 29 letters, seven of which have been modified from their Latin originals to better serve the phonetic requirements of the language. Turkish words have many grammatical suffixes or endings that determine meaning. One word can have many affixes, which can also be used to create new words. Most affixes are used to indicate the grammatical function of a word. Turkish loan words found their way into the English language as far back as the middle ages. Some words of Turkish origin came to English by way of French but by the 16th century loanwords came into use through direct contact between Turkey and Britain. Like English, Turkish does not assign gender to nouns. Verbs come at the end of a sentence and require a suffix to denote the level of formality of speech. As in French, there is a formal and informal you. The manner in which you address people is considered very important in Turkish. Addressing people you are not familiar with by just their name is considered very impolite. Many different titles are used in Turkish to help navigate social situations.